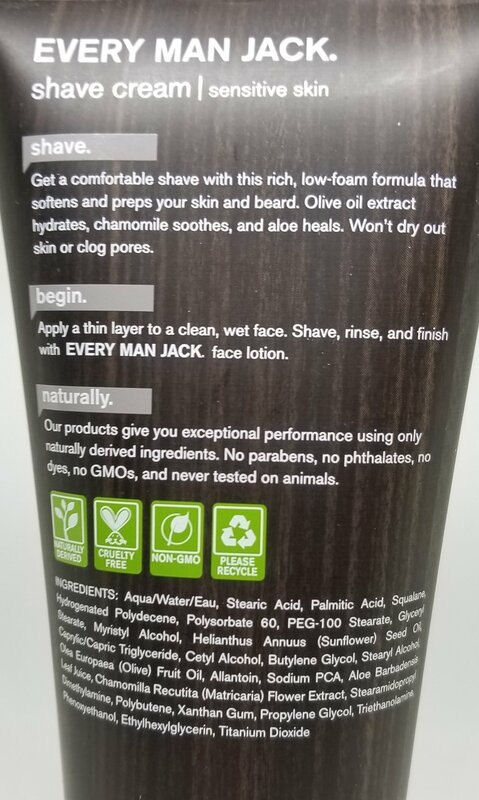 As promised in the first Every Man Jack review, I am continuing on the Every Man Jack product exploration. This morning it was up to the Shaving cream and after shave lotion or balm. 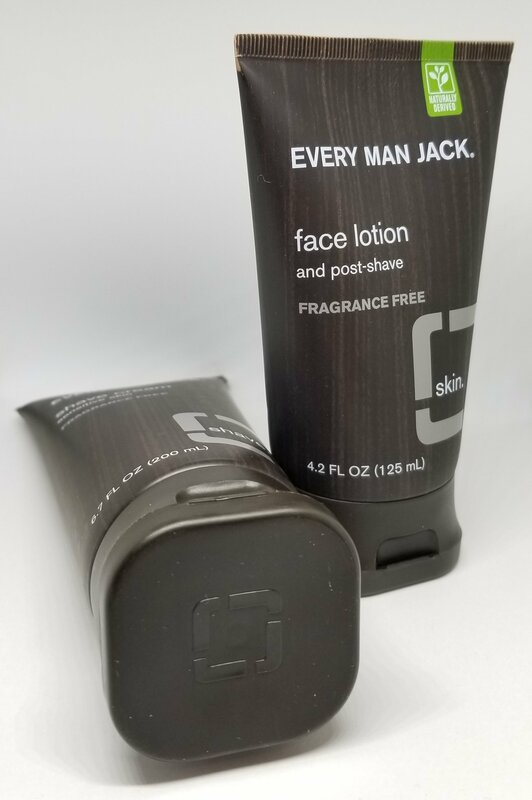 Every Man Jack, as its name states is a product line targeted for “every man”. It is unpretentious, simple and to the point. My tests with the face and body wash showed that these products were up to the tasks. We wanted to confirm that the Every Man Jack shaving suite was equally good. 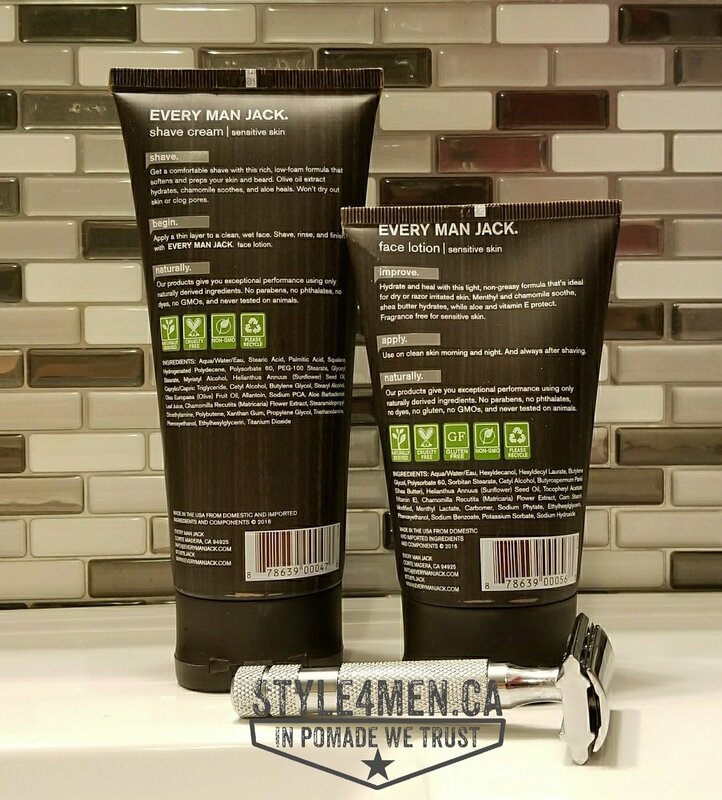 I would like to thank Sarah and Peter at Every Man Jack for their support of the Style4men.ca project and making this review possible. First off the Every Man Jack (EMJ) shaving cream comes in a large tube (200 ml). Considerably larger than the post shave (125 ml). 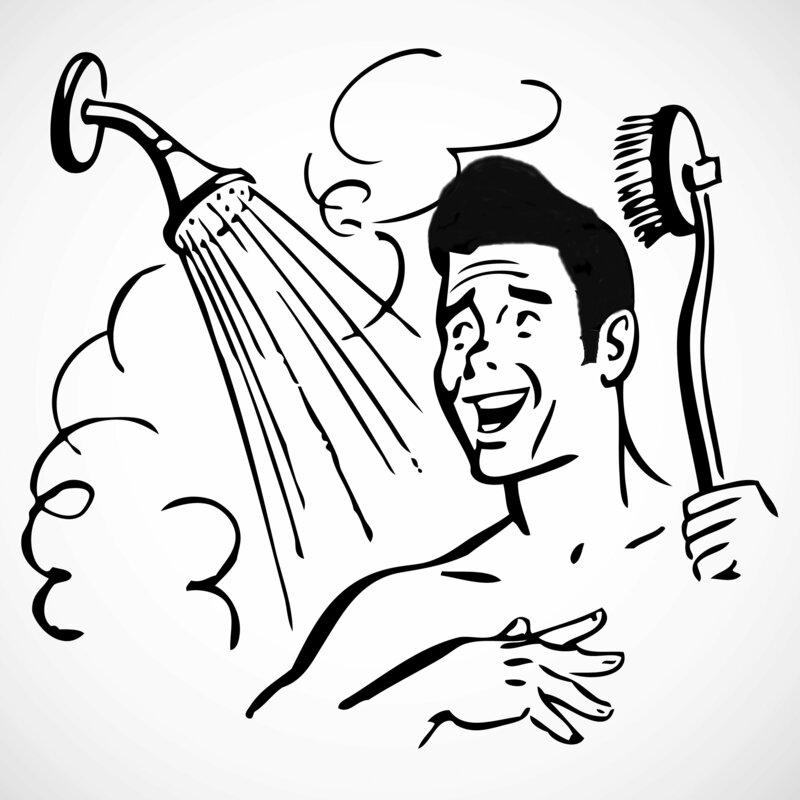 As any shaver will know, you will be going through a much larger quantity of shaving cream than after shave. Packaging appropriate portions will means that you will finish both products about at the same time and not be stuck with an un-partnered product for months. Maybe that’s an insignificant detail, but it conveys some planning on the part of EMJ. Continuing on the packaging, the tubes both sport the product line “faux” wood finish. I personally like it as it is distinctive and well done. Another interesting detail about these bottles that might not come out totally clearly in the photos is the fact that the base of the tube is square. Something rather different that also insures that the tubes are easy to store and won’t tip over easily. 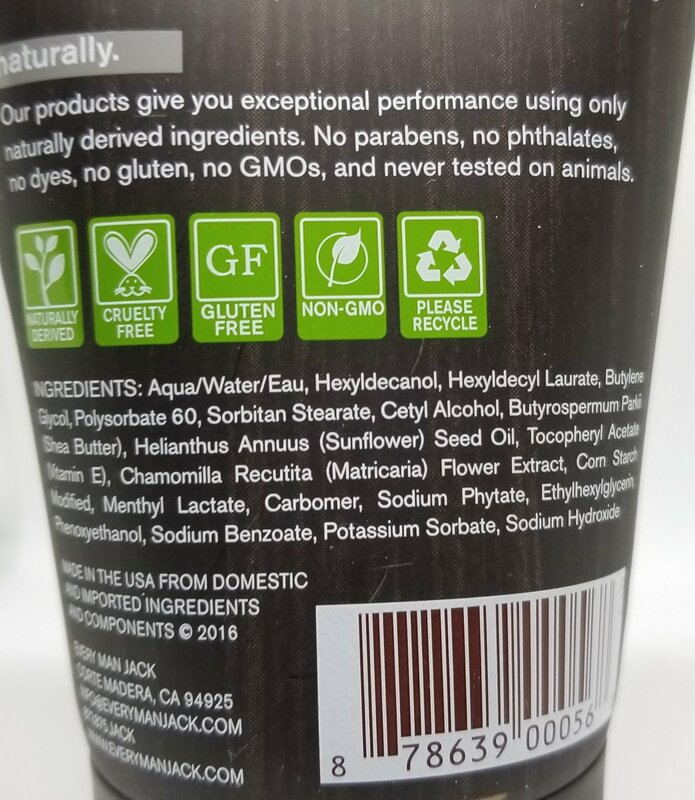 A small mention on the ingredient lists: both product contain sunflower seed oil and the shave cream also has some olive oil while the face lotion/post shave has some shea butter. all 3 of these participants are seen as rock stars in the skin care world. Onto the shave! As indicated above, I am coming out of the shower with a soften beard. I poured out a generous portion of the shaving cream and was pleased to find a very thick and rich product. So thick in fact that I added a bit of water to my face as I applied the cream. This is a product that will lend itself very well to a brush application. Using a brush will also insure that an increase level of moisture is brought to the mix. The white cream stuck well to my mug and I was covered in no time. My fingers detected a good level of oily elements to help the blade glide during the shave. A shave cream has to offer two key elements: protection and lubrication. This cream did an excellent job with both of these tasks. Having the cream stick to your mug is one thing, but it doesn’t always equate to protection or insulation. Here I felt both protected and insulated. The cream actually felt like a thick velvet layer. My razor glided smoothly across in perfect comfort. Now since the cream is rather thick, it required a bit more attention to rinse it between passes. Using very hot water with decent pressure will make a difference. Rest assured the cream dissolve nicely in water. My shave was done in no time and I was impressed with the overall level of comfort the job was accomplished in. No nicks or cuts and no missed areas. My skin also felt great. Rinsing my mug with ha warm towel to remove the left over cream being done, I moved on to the after shave balm. I used a pea size which was sufficient to cover my cheeks and neck. Again, a very nice overall feeling. I will say that suing an aftershave cream or lotion is without a doubt a smoother experience than using a splash, but not all creams are created equal. Some are too oily, or runny or not as agreeable with your skin as you might like. This product was simply perfect. It covered well, was absorbed quickly and did not leave a film or residue. My mug felt great all day. In fact I caught myself checking out my cheeks and neck a few times today and telling myself, damn, this is smooth. In short, I was thoroughly impressed by both of these products. They performed extremely well and made my mug feel fantastic. Considering that shaving is a rather aggressive experience for the skin, this nothing short of an accomplishment.